Carmen was discovered and hired by William “Count” Basie, and was the featured vocalist in the legendary Count Basie Orchestra for nine years. Born in Austin, Texas and raised in Altadena, California, Carmen Bradford grew up with music in her home and in her heart. It was only natural that Carmen would follow in the footsteps of her great family legacy, being the daughter of legendary trumpeter/ composer Bobby Bradford and world renowned vocalist/composer Melba Joyce. Her grandfather Melvin Moore sang with Lucky Millender and Dizzy Gillespie’s Big Band in the 1940s and sang with the Ink Spots, making Carmen the third generation of incredible musicians. She has carved out a place in music history for herself and is playing an integral role in this uniquely American art form called jazz. Carmen Bradford is Jazz Royalty. Carmen was discovered and hired by William “Count” Basie, and was the featured vocalist in the legendary Count Basie Orchestra for nine years. She has since performed and/or recorded with: Wynton Marsalis, Shelly Berg, John Clayton along with the Clayton Hamilton Orchestra, Nancy Wilson, Doc Severinsen, Tony Bennett, James Brown, Patti Austin, Byron Stripling, Dori Caymmi, George Benson, Lena Horne, Frank Sinatra, Joe Williams, DIVA Jazz Orchestra, the National Symphony, Rochester Philharmonic, the Lincoln Center Jazz Orchestra, the Clayton-Hamilton Jazz Orchestra, The Dani Felber Big Band, Dallas Symphony, Oklahoma Symphony, Vancouver Philharmonic,and countless artists around the world. Carmen performed on two Grammy Award winning albums with the Basie band in the 1980’s and later collaborated on a third Grammy Award winning album, “Big Boss Band,” with guitarist George Benson in 1991. Her soulful voice warmed the hearts of Americans through the celebrated performance of the classic duet, “How Do You Keep The Music Playing?” on the “Tonight Show, with Johnny Carson” that same year. Carmen began another chapter in her illustrious career as a solo artist with her critically acclaimed debut album “Finally Yours” (Evidence Records) in 1992. 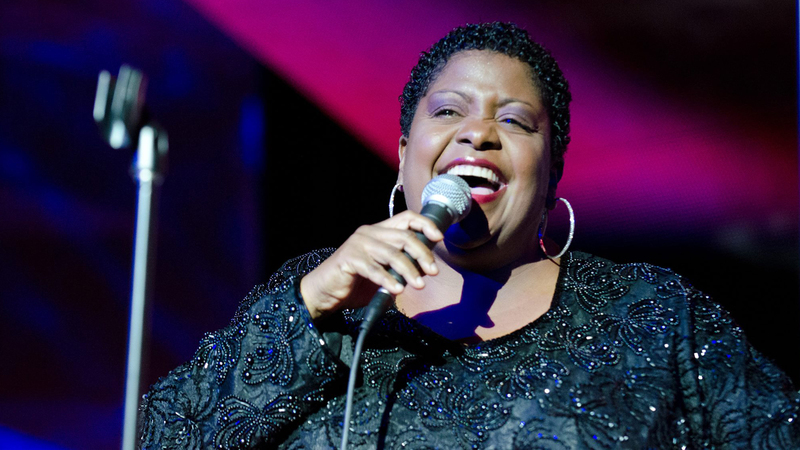 The 1995 release of her second solo album, “With Respect,” (Evidence Records) established the Atlanta-based singer as one of jazz music’s most diverse and exciting vocal stylists proving to the world that Carmen Bradford was a unique voice in jazz in her own right. On occasion, Carmen has loaned her talented voice to stage productions and the music of Hollywood films. She sang on the haunting soundtrack for Oprah Winfrey’s “Beloved,” and recently starred in the title role of Duke Ellington’s Folk Opera “Queenie Pie” at the University of Texas, Butler School of Music. Carmen’s 2004 release, “Home With You,” (Azica Records) is a warm and beautiful collection of piano/vocal duets with talented artist Shelly Berg. The album is yet another departure for Carmen, offering her fans a stripped down, intimate portrait of the artist they have grown to love. Carmen Bradford returned to her big band roots with her new 2008 release, “Sherrie Maricle & The DIVA Jazz Orchestra,” featured on Live From Jazz At Lincoln Center’s Dizzy’s Club. Carmen’s 2015 release, titled John Mills “Invisible Design” featuring Carmen Bradford is another example of Carmen Bradford’s ability to sing all forms of jazz, be it straight ahead jazz, blues or jazz fusion, and swing it like nobody can. With the first, ever, Christmas album, the 2015 release of the Legendary Count Basie Orchestra, directed by Scotty Barnhart, titled ”A Very Swingin Basie Christmas” on Concord Records, with Johnny Mathis, Carmen Bradford, and Ledisi was another first for Carmen as well. In 2016 Carmen Bradford was asked by South African trumpeter, Darren English, to be a part of his new critically acclaimed CD, tilted Imagination Nation on Hot Shoe Records. Whether it’s a duo concert with Shelly Berg, Big Band with the ladies of DIVA or her new favorite: performing with Symphony Orchestras around the world, Carmen Bradford’s body of work reflects a vast depth of musical experience and technical brilliance. She is also recognized for the overwhelming passion she brings to the lyric. She has truly contributed to the perpetuation and preservation of this Great American art form called jazz.